Hope everyone is having a great week! I am excited to here all the success stories from people using the plans and losing weight, this is the reason why I share them, and I couldn’t be happier they are working out for many of you! If you’re new to my meal plans, I’ve been sharing free, 7-day flexible meal plans (you can see my previous meal plans here) that are meant as a guide, with plenty of wiggle room for you to add more food, coffee, beverages, fruits, snacks, dessert, wine, etc. You should aim for around 1500 calories* a day. while ww is great, YOU ARE GREATER1 i just love your meal plans. your meal plans are easy to use and i see the pattern for great eating while being healthy. The meals are real food and are ideal for busy families without breaking the bank. I call it keeping it real. I am a big fan. thank you so much!! Yes I’m using them and loving them! Thanks so much! This is great! Yes! I am interested in your meal plans! As everyone has said, they are truly appreciated and needed. This is my greatest stumbling block after making dinners for a family of 4 for the last 20 years…I’m tapped out! I don’t have any more ideas and frankly, I’m a bit lazier when it comes to making meals. I like being told what to do and how to do it when it comes to meal planning. (not so much on other things!) This will give me a chance to lose unwanted pounds finally, make food that people will love, and get new ideas for meals to make often. Thank you again!! I absolutely love the meal plans! I have been doing a challenge for the past few months and now that it’s over this is the PERFECT way to continue having a healthy eating plan that I don’t have to think about! Thank you for spending your time on creating these Gina! Wow. This could not be more timely! Was just told that I need hip replacement surgery in May. Need to drop 20 pounds. I Think this plan will help! I have tried Amazon, Target and Barnes and Noble, and cannot find the Meal Planner book. Any suggestions or help to find one? Sorry it’s on back order I will announce when its back! I’m using it! Thank you! Thank you so much for taking the time to make these meal plans. All of your recipes are wonderful and my family and I enjoy them so much! I am so glad I discovered your meal plans. So far, everyone has been delicious. And I love having a grocery list made out for me. I just cook whichever one works into my schedule for that day — I just put the drumstick in the crockpot with maple syrup, dijon mustard and balsamic vinegar. That was on the plan for Sunday but works out best for today for me. Can’t wait to taste it. You have a special talent and I’m so glad you make these plans available for free. Wish I had these when I was working but I’m sure going to enjoy them in my retirement. Thanks so much. This looks awesome! I love how you leave the wriggle room… it is so encouraging to eat healthy while being allowed to “cheat”- in other words it is so great that you are spreading a healthy lifestyle rather than fad diets! I am on vacation this week but it will be great to try it out next week. You make t so easy with the shopping list! Please continue adding your meal plans! My family of four which includes two young boys absolutely loves them! Through them I am also learning how to properly balance meals (ie healthy fat, protein, veggies, taste, proportions, calorie count) you are teaching us how to solve these equations! 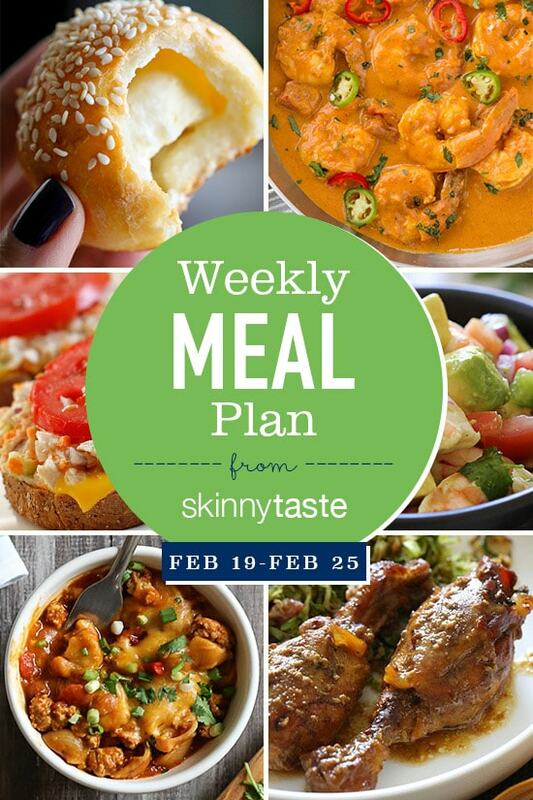 I have been telling everyone o see about this meal plan! I love it!!! It is making my shipping and eating so simple. Thank you!! Just did my weekly shopping using the list above as a guide. 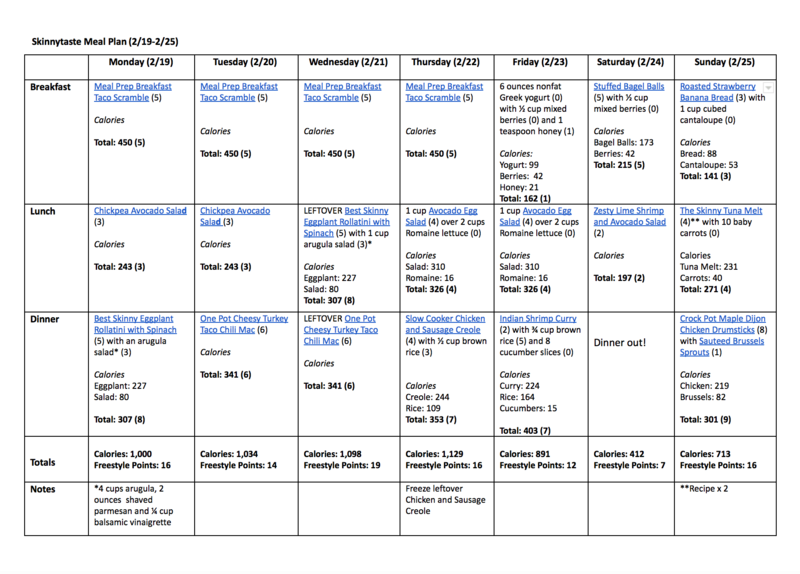 I love the weekly meal plan! Thanks Gina! You are my goddess. I made the bagels today and all is right with the world. Thank you. Thank you. And did I say thank you? Thank you so much for these meal plans! I’ve tried several different meal plans but never could seem to get them to work for us. We are always using your recipes from the site and cookbooks because they are guaranteed crowd pleasers for our crew. These work so well for us! Thank you! You are my go to for delicious healthy recipes. Thank you for all the time and effort you devote to the weekly planning menu please keep them coming! Hi Gina,Looks a perfect meal plan except shrimp.Thanks for the awesome plan. Thank you ever so much for the weekly meal plans, which makes my life healthy AND happy. The amount of work that is put into planning this is amazing.You Are Appreciated! I started WW a couple of weeks ago and I have lost 6 lbs!! I have been using your menu plans every day. Your recipes are amazing! Hi Gina! I am so grateful for your recipes and your focus on healthy eating. Please keep the meal planning coming, really is so helpful and yummy! When is your latest and greatest next cookbook coming out? I find these menus especially helpful. First as a guide to balance and as a template to trigger my own preferred foods. And being able to go to the have the recipe links right there. I am saving them and as I need inspiration I refer back to them Thank you for doing all this for those of us who are inspired by both the menus and recipies. I have followed you forever and love these weekly plans. Please know many of us who never comment are grateful and hope you know we use your wisdom daily! Yes please keep offering this. It is so convenient for a working mom. Love your recipes! Please keep offering the meal plans. I just started WW and this will be a great help. Thanks very much. Thanks for sharing this week! We are making most of these recipes this week inspired by your post. Yes, please, keep offering the meal plans! They have been SO helpful to me in staying on-course. THANK U, THANK U! *Have preordered ur next cookbook from Amazon (where I do most of my shopping)! Can’t wait! I will be usiing your meal plan as of now. Looks great with the shopping list. Thank you so much. My downfall is planning meals. Your post is an answer to prayers. Hopefully in time using your recipes as an example I will be able to plan my own meals . I haven’t had a chance to make anything but a friend says your recipes are awesome. Hello there, love these meal plans! What is included in the arugula salad? This is awesome! I’ve totally been using them and would love for you t to continue doing them. Love this! Thank you. Very easy w a family of 4 going in 6 diff directions each evening. Have good intentions to meal plan on sundays for the week but bedtime arrives and realize I ran out of day to do it. I love your recipes and the meal plans! I generally cook for one, so I either freeze or share the meals. sometimes I don’t make a dinner and eat as left overs. Thank you! It’s truly nice to find a one stop place to find great recipes and weight watchers info ,too! Keep the site going. Love it and thank you!